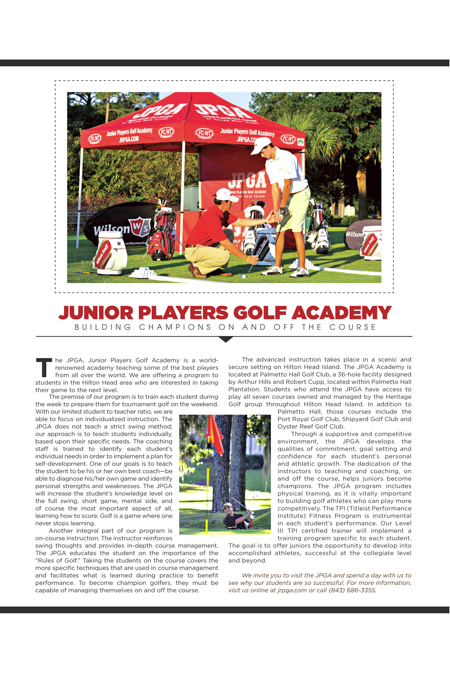 The JPGA, Junior Players Golf Academy is a world-renowned academy teaching some of the best players from all over the world. We are offering a program to students in the Hilton Head area who are interested in taking their game to the next level. The premise of our program is to train each student during the week to prepare them for tournament golf on the weekend. With our limited student to teacher ratio, we are able to focus on individualized instruction. The JPGA does not teach a strict swing method; our approach is to teach students individually, based upon their specific needs. The coaching staff is trained to identify each student’s individual needs in order to implement a plan for self-development. One of our goals is to teach the student to be his or her own best coach—be able to diagnose his/her own game and identify personal strengths and weaknesses. The JPGA will increase the student’s knowledge level on the full swing, short game, mental side, and of course the most important aspect of all, learning how to score. Golf is a game where one never stops learning. Another integral part of our program is on-course instruction. The instructor reinforces swing thoughts and provides in-depth course management. The JPGA educates the student on the importance of the “Rules of Golf.” Taking the students on the course covers the more specific techniques that are used in course management and facilitates what is learned during practice to benefit performance. To become champion golfers, they must be capable of managing themselves on and off the course. The advanced instruction takes place in a scenic and secure setting on Hilton Head Island. The JPGA Academy is located at Palmetto Hall Golf Club, a 36-hole facility designed by Arthur Hills and Robert Cupp, located within Palmetto Hall Plantation. Students who attend the JPGA have access to play all seven courses owned and managed by the Heritage Golf group throughout Hilton Head Island. In addition to Palmetto Hall, those courses include the Port Royal Golf Club, Shipyard Golf Club and Oyster Reef Golf Club. Through a supportive and competitive environment, the JPGA develops the qualities of commitment, goal setting and confidence for each student’s personal and athletic growth. The dedication of the instructors to teaching and coaching, on and off the course, helps juniors become champions. The JPGA program includes physical training, as it is vitally important to building golf athletes who can play more competitively. The TPI (Titleist Performance Institute) Fitness Program is instrumental in each student’s performance. Our Level III TPI certified trainer will implement a training program specific to each student. The goal is to offer juniors the opportunity to develop into accomplished athletes, successful at the collegiate level and beyond. We invite you to visit the JPGA and spend a day with us to see why our students are so successful. For more information, visit us online at jrpga.com or call (843) 686-3355.